Sister Simone Campbell will keynote CAP Services’ 50th anniversary event – CAP Services Inc. 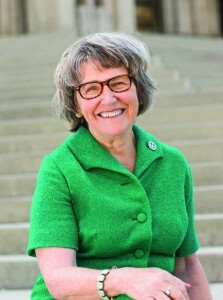 Sister Simone Campbell, executive director of the national Catholic social justice lobby NETWORK, is the keynote for CAP Services’ 50th anniversary recognition event Wednesday, May 25, in Stevens Point. CAP Services will hold a 50th anniversary recognition event featuring keynote speaker Sister Simone Campbell Wednesday, May 25, at SentryWorld, 601 N. Michigan Avenue, in Stevens Point. Sister Simone is the executive director of the national Catholic social justice lobby NETWORK, where she lobbies on issues of peace-building, immigration reform, healthcare and economic justice. She has led three cross-country “Nuns on the Bus” trips, focused on economic justice, comprehensive immigration reform and voter turnout. Sister Simone has often been featured in the national and international media, including appearances on 60 Minutes, The Colbert Report, and The Daily Show with Jon Stewart. She has received numerous awards, including a Franklin D. Roosevelt Four Freedoms Award and the Defender of Democracy Award from the international Parliamentarians for Global Action. She is also the author of A Nun on the Bus: How All of Us Can Create Hope, Change, and Community, published in April 2014 by HarperCollins. Sister Simone will speak as part of CAP’s one-hour recognition program, scheduled to begin at 6:30 p.m. The program will also feature an introduction from Patoka and recognition of CAP clients who made significant progress in the previous year. A limited amount of public seating is available. RSVP is required. Visit capservices.org/50th to reserve your space today. Sister Simone’s visit to the area, which will also include a panel discussion on poverty issues on Wisconsin Public Radio’s Route 51 program, is sponsored by Delta Dental of Wisconsin. Sponsors of additional CAP Services anniversary outreach and awareness activities include Ministry Medical Group, BMO Harris Bank, SVA Professional Services, Spectra Print, Central Waters Brewing Company and Poky Pedaling Stevens Point.